Hormann MZ doors are manufactured from double skinned steel panels giving high strength and insulation. The doors come ready hung in a steel frame making installation quick and simple. 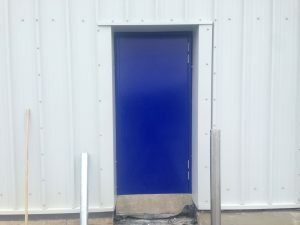 There is a range of furniture to suit the application, panic furniture for fire escape doors and lever handles in plastic or stainless steel for personnel doors. 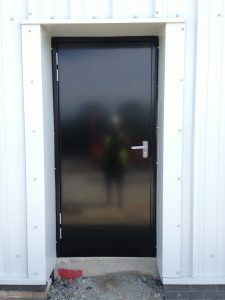 We can also cope with wide openings with a double door set. Attractive glazing can also be provided in the MZ doors to make the most of natural day light. Glazing: 7-mm wired glass as standard, on request with 20-mm insulated wired glass.